Its been several years now since mobile phones graduated from being just phones to mobile computing devices. They are now the center of your digital life and are a principal means of consumption and to some extent even creation of your personal content. As capabilities increase however, the humble smartphone is graduating to a greater role. The role of your digital hub. With your smartphone as the hub of your content, linking to the internet and your local multimedia libraries it is the mobile phone that is doing the heavy lifting with various solutions on offer to bring this content to the big screen. Silicon Image, a provider of semiconductors for mobile electronics has been responsible for leading the effort to create a common standard for an audio/video interface that brings your consumer electronics device to any standard HDTV. Mobile High-Definition Link or MHL as it is popularly known is one such solution that aims to bring your smartphone to a large screen and to enable you to view all your high definition content on the best screen in the house. A one stop solution that unchains your media and lets you view all of it in glorious 1080p, 60FPS with up to 8 channel audio while simultaneously charging your device. Built in CEC capabilities means that your television remote can also be used to control your handset. Till a few years ago, it wasn’t all too uncommon to spot handsets with a mini HDMI slot. The Nokia N8 being a particularly famous example of it. If it was possible to output to HDMI directly then why do we need another standard at all? The development of MHL followed the evolution of smartphones as they grow slimmer still. 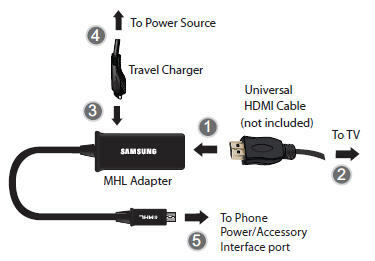 A standard HDMI port requires 19 pins while MHL drops this requirement to just 5. Additionally power consumption is a big factor which was at play during the development of the standard. At standby mode, the MHL IC consumes 30μA while high power consumption during active transmission tops off at 40 mW. This proves to be close to 10 times lower than HDMI transmitters. A major factor when designing for a portable device. 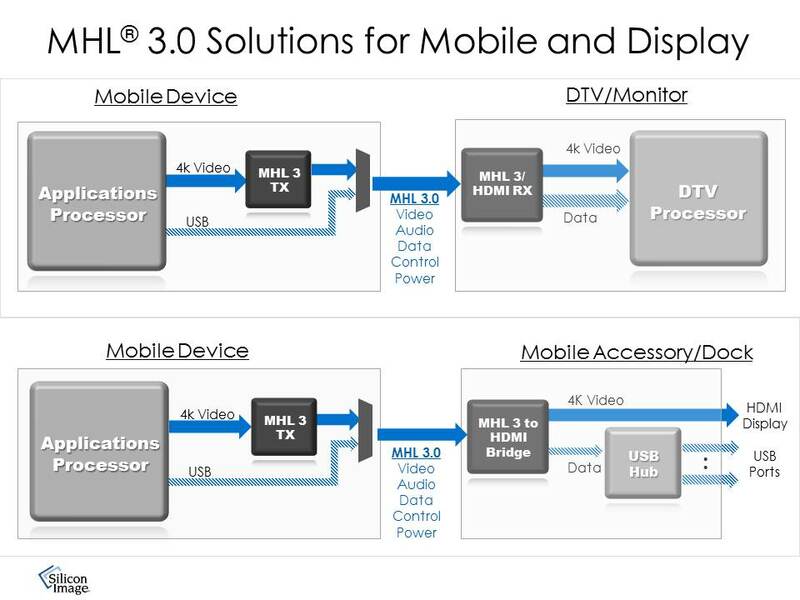 Of course the fact that the latest MHL 3.0 standard can carry a power signal of up to 2A weighs heavily in its favor as it can charge most smartphones or tablets during operation. Announced in August 2013, the standard has seen quick adoption across high end flagship devices with the Sony Xperia Z2 being the first to actively demo the capabilities of the Sil8620 chip. The newest version of the standard brings several forward looking improvements including output at up to 4K resolutions. This was a key point for the Z2 with it being amongst the first devices to shoot 4K video. As mentioned above, the standard also allows it to carry up to 2A of power to maintain charge in the handset. It brings HDCP 2.2 compliance as well as support for 7.1 surround sound audio. Mobile High Definition Link as a standard has seen much wider adoption than the equally capable but proprietary Slimport which is based on Display Port technology. With MHL 3.0, you also get the capability to connect your handset to touch capable monitors alongside a USB drive to essentially make your handset a computing hub. This has far reaching ramifications. While software maturity remains a concern at the moment, there is no doubt that we’re approaching a future where smartphone / tablet operating systems like Android or iOS will be capable enough for a vast majority of people to perform daily computing needs. The MHL standard provides capabilities to facilitate having a dock where you just slot in your phone and you can continue your experience on a bigger screen with local storage added for good measure. MHL also gets around the latency issues that are evident with Miracast, WiDi and a myriad other wireless streaming technologies. Silicon Image also offers a solution that operates on 60 GHz WirelessHD and is suitable for high quality, near-zero latency wireless video connectivity. 2.4 GHz and 5 GHz based Wi-Fi and other technologies suffer from interference and bandwidth limitations that are insufficient for robust, zero lag connectivity with good quality of service. That said, this solution is far from commonplace and it is a while before it will see widespread adoption as seen for MHL. 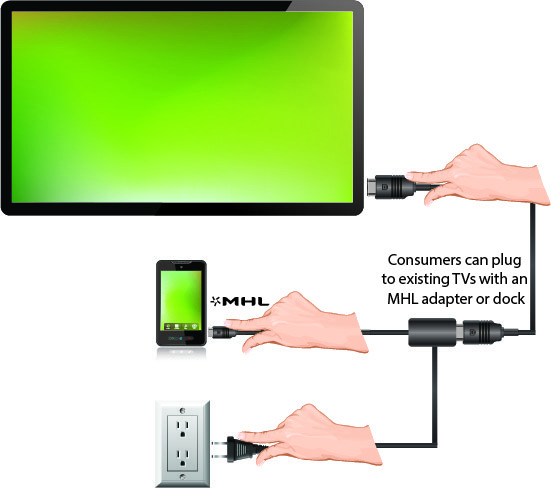 MHL or Mobile High Definition Link leads adoption amongst several other solutions on offer to extend your smartphone screen to the biggest screen in the house. While it provides us the tools to get there, the software part of the equation is just not ready yet to allow you to ditch your computer. With every progressive update, wireless streaming too is catching up. Indeed Silicon Image too has a wireless streaming product that can beam content at 60FPS. With that in mind, it is hard to declare a standard as the winner. What is definitely true though is that going forward, your smartphone will play a much bigger role in being the centerpiece of your digital life and players like Silicon Image are going to facilitate that.